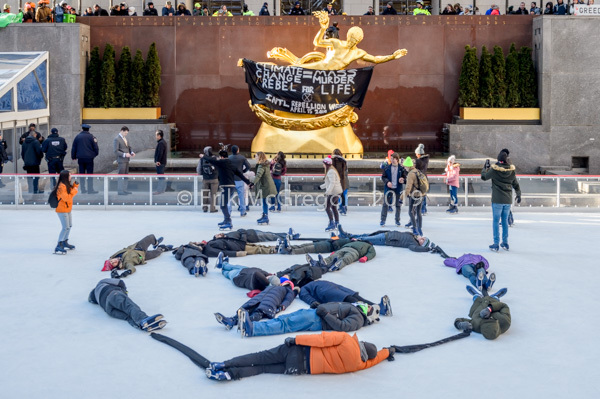 New York, NY – Nine arrests were reported at the US Extinction Rebellion (XR), the first major New York City civil disobedience action of a dynamic, bold new environmental movement. 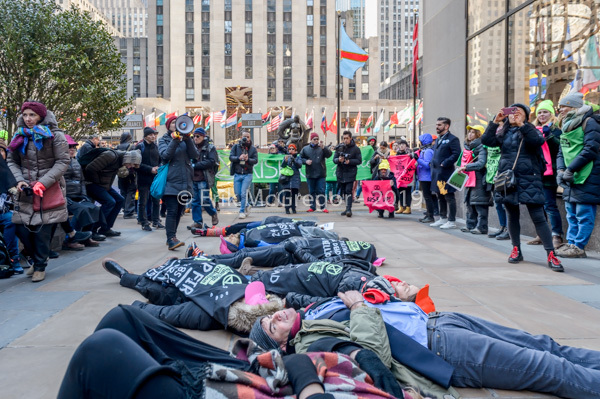 A nonviolent action was organized on January 26, 2019 to temporarily shut down Rockefeller Plaza, a prominent New York City landmark to create awareness of the extreme peril of the climate change emergency through a nationwide day of nonviolent civil disobedience and protest. 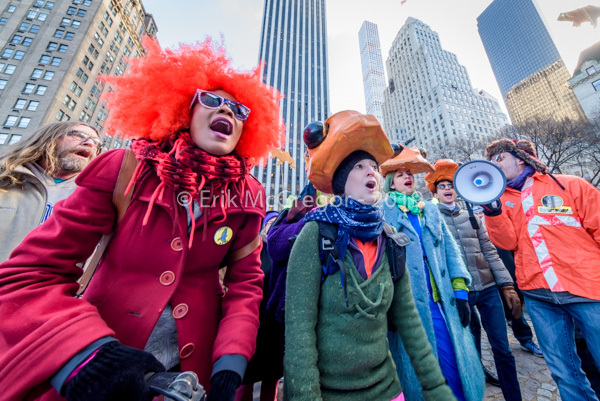 The activists meeting place for the event was the southeast corner of Central Park at 59th Street and 5th Avenue, in Manhattan. From there, they were directed to the the place where the actual civil disobedience action took place. In response to a nonexistent threat, President Trump in December initiated the longest government shutdown in the nation’s history. 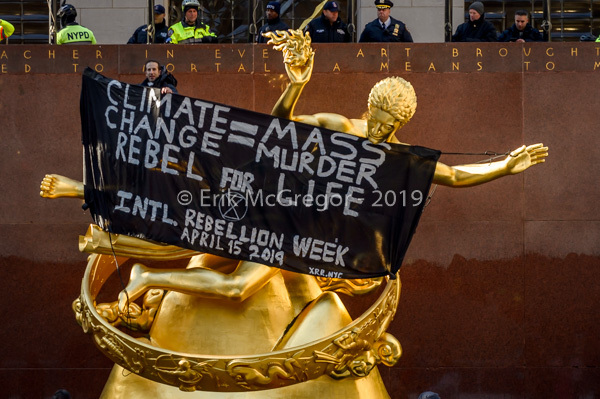 For the greatest actual existential threat humanity has ever faced – worldwide climate chaos – XR-NYC, on behalf of the people of New York City and the world, will engage this Saturday in NYC: Rebellion Day One, a symbolic, temporary shutdown of a significant local institution. 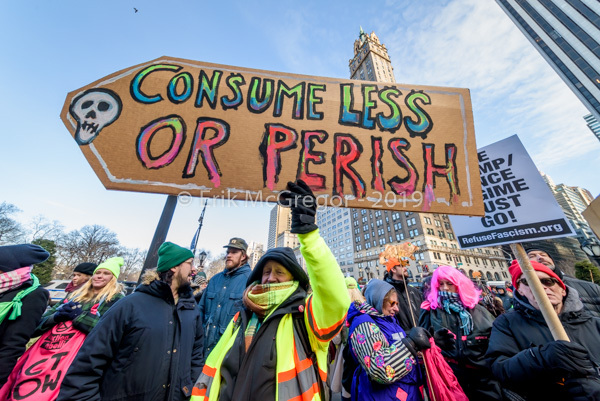 In this way, XR-NYC intends to send a message to politicians on all levels: business as usual on the environment will not be tolerated. 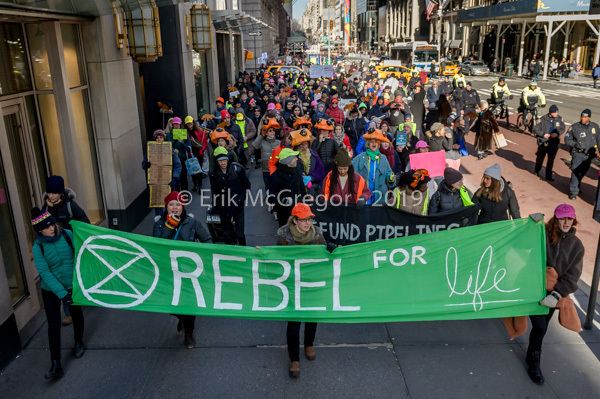 Over the last 3 months, Extinction Rebellion has established groups in over 35 countries, and 30 US cities, while also gaining the endorsements of leaders like Noam Chomsky, Bill McKibben, and hundreds of climate scientists. On January 26, we use this massive momentum for a day of action that will create disruption, spread the word, and recruit. We’re just getting started, so these actions are building the base. 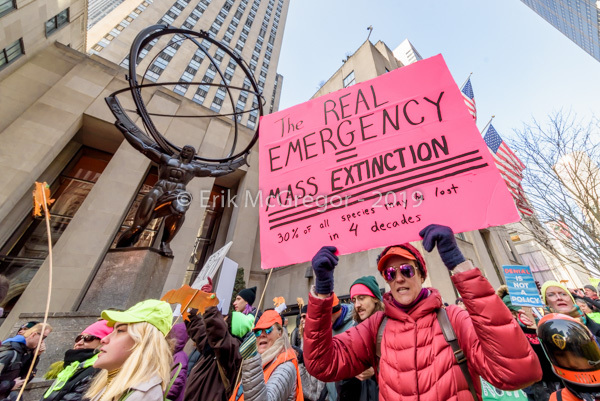 But we’re facing extinction, so we know that nothing short of mass mobilization will save us. 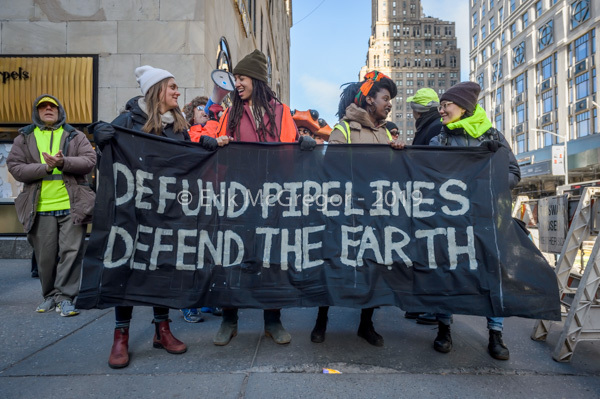 We are doing this because all the polite, respectable means that activists have used to try to bring to an end the conditions that are fast making the whole world’s climate uninhabitable have not worked. 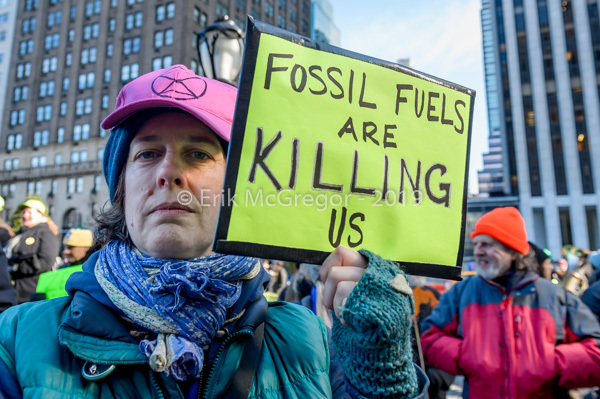 This is despite the fact that there is now unprecedented attention to the climate issue, because of the Green New Deal and the recent dire scientific reports. It is time to take protest to the next level – the level of rebellion. 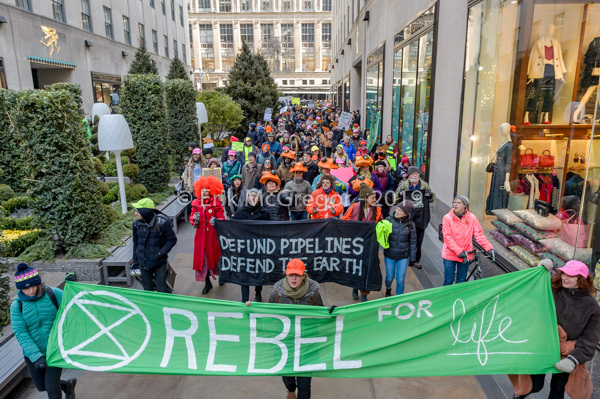 Founded in the UK in late 2018, XR is an international movement that carries out nonviolent direct action (NVDA) and civil disobedience campaigns with a worldwide impact. In November, XR in London occupied the five main bridges over the River Thames for six hours, described as “one of the biggest acts of peaceful civil disobedience in the UK in decades.” Shortly afterward, Mayor Sadiq Kahn declared a climate emergency. In the UK, the movement, which is less than six months old, has achieved enormous media visibility. In November, XR in London occupied the five main bridges over the Thames for six hours. This was described as “one of the biggest acts of peaceful civil disobedience in the UK in decades.” In the same month, a number of XR activists super-glued themselves to the gates of the UK government’s residence at Downing Street, and others held a memorial service in Parliament Square to “mark the loss of life the planet is experiencing.” At about the same time, London Mayor Sadiq Khan declared a climate emergency — and many observers believe it was not a coincidence. 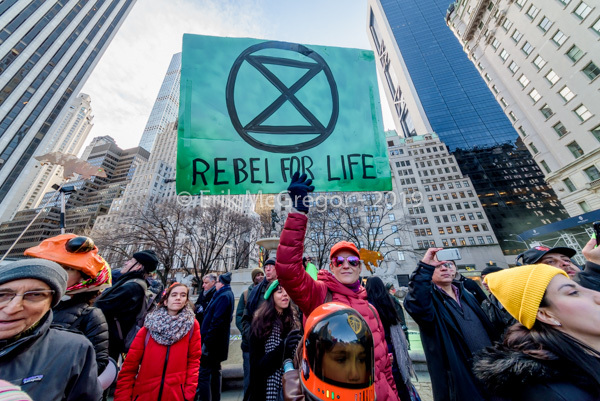 Extinction Rebellion is an international movement dedicated to raising the alarm about the dire threat of climate change and using mass nonviolent civil disobedience to force governments to take action.